I hope everyone had a fun-filled Labor Day weekend! Mine was great- very low key with no set plans which was great! Friday night was super hot but still gorgeous so we packed up a picnic and headed to Point State Park. I love that I can just walk right to this gorgeous scenery! The sunset was incredible and Henry was loving life! With a shortened week, the days have just flown by! I cannot believe we are almost to Friday! We are celebrating my friend Dani's birthday on Saturday and tailgating for the Pitt/Penn State game (woo!!). I'm also excited because it seems we will be getting a break from this insane heat! It's been in the 90's all week and I am so ready for the forecasted upper 60's! 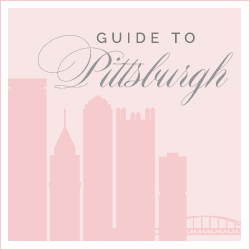 It has been so hot that schools around Pittsburgh have been closed or have early dismissals. Crazy. I hate to complain about the heat, though, because before you know it, it will be frigid here in Pittsburgh. Ick! I am all about fall but I get a quick pang of sadness for the passing of summer. I'm thankful for the summer I have had. It was exactly what summer is supposed to be: fun!! Here's to hoping the rest of my year looks that way, too! 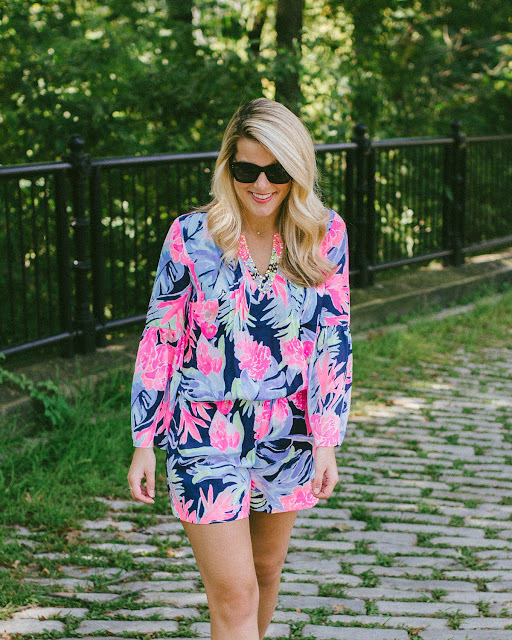 Lilly Romper will be marked down to $49! Sale-ing: Just a reminder that the Lilly After Party Sale is on Monday! I partnered with some blogger friends to do a big $1000 giveaway on Instagram, so head over if you'd like to enter! Eating: Carmelized onion cheddar from Trader Joe's! I share it on my instastories from our picnic and I know some of you know about this amazing cheese because of your DM's! This cheese is SO good. It tastes like french onion soup! I haven't melted it yet, but I think it would be amazing as grilled cheese! Drinking: Sofia Brut Rose minis! Tailgating season is upon us! At a lot of tailgates, the popular beverage is beer. I really do not like beer so I am always looking for the best things in cans that aren't beer. The Sofia brut rose minis are perfect for tailgating and are deliciously dry! Reading: I finally finished The Two Mrs. Grenvilles and it was SO good. You must read it! The first half of the book starts off slow, but it kept my interest. As I got farther into it, though, I became hooked! Apparently, there is also a movie adaptation from the late 1980's so I want to check it out! Watching: Have you watched Ozark? I was so excited to see season two come out! I have started it and am about halfway through the season. On deck is the Netflix movie, To All The Boys I've Loved Before! I've heard so many people are loving it! Listening: September's playlist has started but I have yet to find anything I am particularly loving! Song suggestions are always welcome! Loving: Dermalogica just released a Rapid Reveal Peel and they were kind enough to send me it to try! I'm all about any product that will exfoliate or 'peel'- I think any type of AHA is so good for clearing up my skin. I find it clears my acne, acne scars, dark spots, etc. This set comes with 10 treatments but after trying it out, I think you could get two treatments per tube and really get 20 treatments. I was really impressed- it is a watery gel that you put on your face for 3-7 minutes and then rinse it off. That's it, super easy. It does burn- almost as much as a professional chemical peel. I love a good burn because then I know it is working. The next morning after the first treatment, my face felt so much softer and already looked clearer. Wanting: All the fall things. I know it's hot but I am so so so so so over wearing as little as humanly possible to stay cool! I am ready for jeans and sweaters and loafers! Smelling: This amber balsam candle smells SO good! It's a little manly and has hints of cedar and just an all-around cozy scent! It's a lighter scent so it won't give you a headache and is a great scent for September- not yet time for pumpkins! Traveling: I'm headed to Charleston in 2 weeks for a wedding! I'm so excited to be headed back and I'll also be going to Charlotte to visit Callie! Quoting: 'Treasure every moment. Not the next day. Not the next year, but right now. This is the present.' - Nicole Addison // See more of my favorites, here. I'm SO JEALOUS you're going to Charleston! I love it there, I bet the wedding will be absolutely stunning! Thanks for your personal marvelous posting! I seriously enjoyed reading it, you're a great author.I will remember to bookmark your blog and will come back from now on.